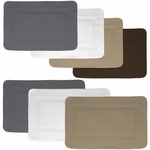 Wholesale Frisse Shag Accent Rugs with Free Shipping! Our two-tone Frisse Shag rugs are ideal for the kitchen or entry way. They have a light weight latex backing to prevent sliding. These rugs a resilient and maintain their appearance after multiple washings. The Frisse Shag Accent rugs are available in Medium (21" x 34") or Large (28" x 48") sizes. Colors available: two-tone in Gold, Green, and Brown.